I know, I know. How can anyone have the same pillows on their sofa for 22 years? 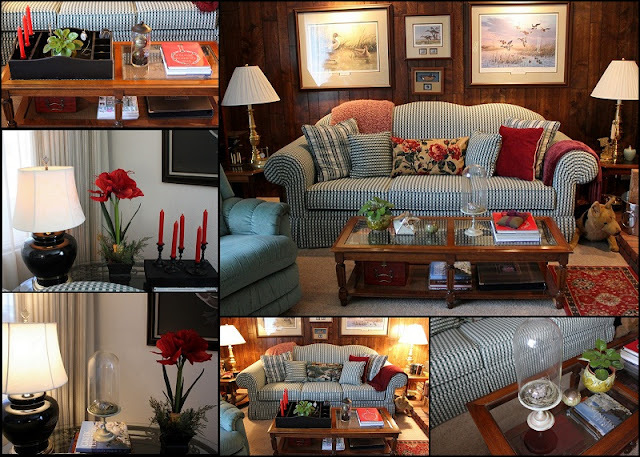 Well the answer is - Sweetheart and I remodeled our home in 1990 and purchased all new furniture for the living room. The hounds tooth sofa came with the pillows you see in this photo. Our daughter had just been married in February of 1990 and we started to remodel the next month. We actually remodeled the entire house. Some folks move to a different house. Well we just moved to the garage for 6 months. The weather was beautiful so we forged along doing most of the work ourselves. I added the burgundy pillow last year and the throws are in the same color tones so I keep them on the sofa during the winter. Being empty nesters the furniture has worn very well over the years. Our kitchen on the other hand is in dire need of a face lift. 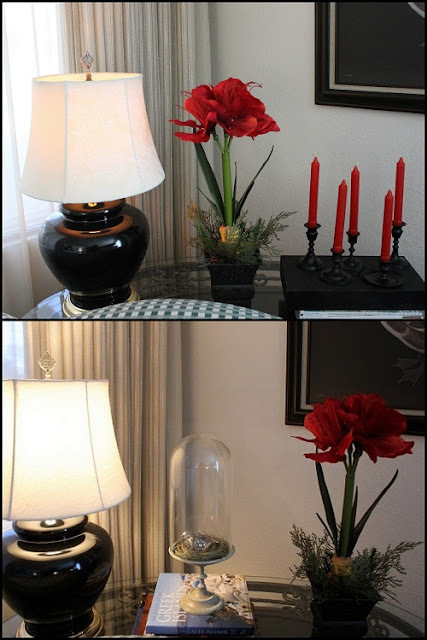 I've had this vignette on the sofa table for awhile and I'm ready for spring and a new look. I have some camellias blooming in the front yard and I think I will bring them in the house and give this table a fresh look. I have been switching things around on the coffee tables, but I think the tables and mantel are going to get a new redo real soon! My sister-in-law and I were shopping at yard sales when she spotted this fabric. Buy it, buy it I heard. I didn't know what I was going to do with it, but I'm so happy I had this fabric around when my creative juices started to flow. And of course blogging is so inspiring. Such beautiful homes and decor. Now this is the amazing part. I had just enough fabric to cover two pillows. One pillow for the sofa and one pillow for the love seat. I just love them. As they say in blog world Easy Peasy. To make the pillow cover I sewed a pillow case with the new fabric. And then hand stitched the bottom of pillow cover closed. To recover the pillows I will just open up the bottom with a seam ripper and remove the original pillow. Ta-da..
Another look at what is going to be history in a few weeks. LOL! Just a recap of my Before and After Pillow makeover. I love to make mosaics for every post. I'm joining a few parties so hop along with me. Love that floral fabric. It looks great with your furniture. I'm always making new covers for our cushions. And I'm with you on putting money towards travel rather than a fancy house. What a nice change that new cushion cover must be. I love the feeling of having a project in mind and knowing that everything I need is at hand. Very nice changes and I totally understand the do it yourself concept of decorating and remodeling. I also would rather travel than spend money on other stuff. We are at that stage where our house needs a new roof so that will be the next major expense around here. Have a great week. Looks like a wonderful room to come and relax. I love the new fabric. What a new bit of cheer to welcome the upcoming Spring. Everyone needs a change now and then. The fabric is very lovely. 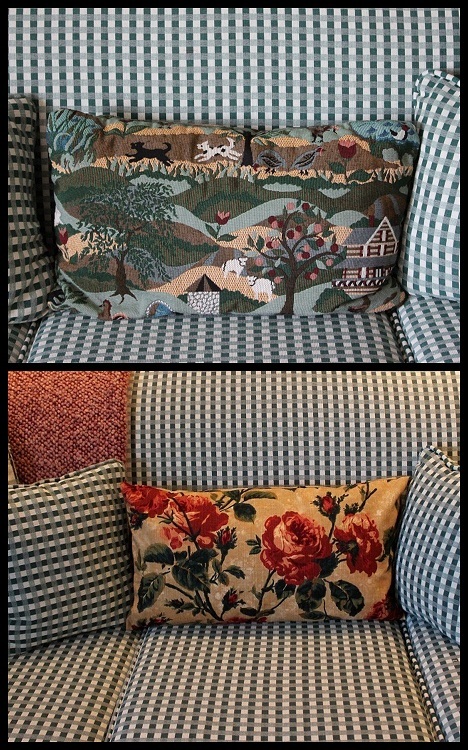 A beautiful makeover job on your pillows. The fabric is beautiful. I would also give up things to travel, I love to travel and see new places. Great post, have a Happy week! Sometimes its the little changes that can make a big difference. The new fabric on your pillows is lovely. Really amazing! That one new pillow cover changes 'dated' to welcoming! Just that one change transformed the sofa from country to cottage (to my eye). I am now looking at my pillows with a critical eye. Too soon to replace furniture, but a pillow, I can do!! Thanks for the inspiration. Your pillow changes look great. Love it! Your room is really comfy and so pretty. I love the pops of red you have in there. The stuffed dog is fun too. Looks great. Thanks for the inspiration!